February » Barringer & Barringer Inc.
Plant Environment: Prefers a sunny to semi-shade planting location. Needs only average soils that drain well. Once established is fairly drought resistant. 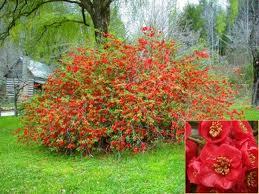 Plant Bloom: Scarlet red clusters of flowers appear in early spring, before the glossy green leaves emerge. An edible yellow fruit appears by fall that can be made into a tart jelly. Flowering quince bushes attain the most compact, uniform branching and prolific flowering if grown in full-sun conditions, and receive at least six to eight hours of direct sunlight daily. They can be used as a single solitary accent plant or incorporated in a border planting.